We’d love your help. 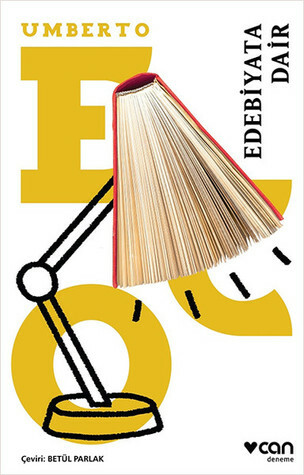 Let us know what’s wrong with this preview of Edebiyata Dair by Umberto Eco. Kendime sıkça sorduğum bir soru var: Bugün bana birileri yarın kozmik bir felaketin evreni yok edeceğini söylese, yani bugün yazdığımı yarın okuyacak hiç kimse kalmazsa, yine de yazar mıyım? İlk anda buna hayır yanıtı veriyorum. Kimse beni okuyamayacaksa neden yazayım ki? İkinci anda yanıtım evet oluyor ama sadece galaksilerin yaşadığı felakette birkaç yıldızın hayatta kala Kendime sıkça sorduğum bir soru var: Bugün bana birileri yarın kozmik bir felaketin evreni yok edeceğini söylese, yani bugün yazdığımı yarın okuyacak hiç kimse kalmazsa, yine de yazar mıyım? İlk anda buna hayır yanıtı veriyorum. Kimse beni okuyamayacaksa neden yazayım ki? İkinci anda yanıtım evet oluyor ama sadece galaksilerin yaşadığı felakette birkaç yıldızın hayatta kalabileceğine ve yarın bir gün birilerinin benim göstergelerimin sırrını çözebileceğine yönelik umutsuz inancım yüzünden. O halde, Kıyamet'in eşiğindeyken bile yazmanın hâlâ bir anlamı var. To ask other readers questions about Edebiyata Dair, please sign up. Do you need to read some other books to understand some essays in this one? There is a lot more here than the title suggests: 'On Literature' includes a history of Italian anti-Americanism, and a piece on the power of lies and deceit throughout history, moving from the Donation of Constantine to the Hollow Earth theory. Still, it is no surprise that Eco's interests are wide and deep. He writes about the imaginary worlds within worlds of Borges, Joyce's literary influences, Aristotle's Poetics and Dante's Paradiso. He plays around with aphorisms and picks apart etymology There is a lot more here than the title suggests: 'On Literature' includes a history of Italian anti-Americanism, and a piece on the power of lies and deceit throughout history, moving from the Donation of Constantine to the Hollow Earth theory. Still, it is no surprise that Eco's interests are wide and deep. He writes about the imaginary worlds within worlds of Borges, Joyce's literary influences, Aristotle's Poetics and Dante's Paradiso. He plays around with aphorisms and picks apart etymology in essays about semiotics. One or two of these essays would be enough to justify buying the book - the opening piece, 'On Some Functions of Literature', is a love letter to reading and understanding, and 'The Power of Falsehood' is a too relevant study of political deceit. There is only one thing that you write for yourself, and that is a shopping list. It helps to remember what you have to buy, and when you have bought everything you can destroy it, because it is no use to anyone else. Every other thing that you write, you write to say something to someone. I have often asked myself: would I still write today if they told me that tomorrow a cosmic catastrophe would destroy the universe, so that no one could read tomorrow what I wrote today? My first instinct is to reply no. Why write if no one will read me? My second instinct is to say yes, but only because I cherish the desperate hope that, amid the galactic catastrophe, some star might survive, and in the future someone might decipher my signs. In that case writing, even on the eve of the Apocalypse, would still make sense. One writes only for a reader. Whoever says he writes only for himself is not necessarily lying. It is just that he is frighteningly atheistic. Even from a rigorously secular point of view. Seen this film by Luc Besson? A 21 hour plane trip is usually the only chance I have to watch a few films. The last long journey I made offered such a dismal selection that for this trip I was already packed with every single one of those books on my 'currently reading' list and determined to finish each (and write a review) whilst on the first and longest leg of my two sector flight. The best laid plans of ants and a person. I decided to start with Umberto Eco, and following my fickle habit, I ope Seen this film by Luc Besson? I decided to start with Umberto Eco, and following my fickle habit, I opened his book at random. Oh yes, I'd already read the first few essays, and jumped ahead to the last two, so now I was left with the real guts of the book, what lay between its covers. At this point you might be asking yourself why would a self-professed I-am-not-a-literary critic bother with Eco's On Literature ? The answer roams around and finally arrives at this: in a prior romantic incarnation, I'd been given The Name of the Rose by my one-time lover and told to "broaden my mind". Eco exploded my mind. Don't ask me why - I'm excellent at remembering my feelings, and a disaster at remembering the reasons. But as an attempt: it had something to do with the allure of Europe (still to be explored), mediaeval history (I know very little), mystery (yes, please) and double entendre (which I probably didn't realise, and still don't). At some point after that I read Foucault's Pendulum , in that miserable after-life one endures for a while when a relationship implodes. Eco impressed me still more. I stranded myself within The Island of the Day Before and came to an abrupt and crashing halt in the first pages of Baudolino . Eeyyuuwwhh. What happened, Mr Eco? We'd been enjoying such a lovely dalliance until you stuffed your character with his testicles and paraded him naked through the streets lined with a screaming mob baying for his blood. The allegory lost me. And so did Eco. Until one day a few weeks ago I was browsing in a little bookshop in the bowels of the Dandy Mall located on Cairo-Alexandria Road just at the toll-gates exiting Greater Cairo. It's usually a safe bet for kids' books, and as serendipity would have it, On Literature happened to be falling from the top of a Pisa pile of books. I picked it up and rifled though it, curious, with that nonchalant distance time delights in using to craze the patina of a by-gone affair. Something hooked me and now I know why. But I needed a film, which I've just finished watching, to put On Literature into perspective, to show me how Eco's thoughts relate to a modern interpretation and playful satire on our popular film culture. Following my re-acquaintance with Mr Eco (we're both too old now for that first flush of infatuation), I needed a change of scene. Unlike previous lacklustre film offerings, this flight had a dazzling array - Italian, German, Japanese, Indian, not too mention two gorgeous sounding filmed operas Das Rheingold and Le Nozze di Figaro. The Social Network was also premiering (and to keep the peace with my partner, I agreed to watch it - and I recommend it also) but the description of Luc Besson's eccentric-sounding film hooked me as my first choice. If you haven't seen it, and I recommend you do, The Extraordinary Adventures of Miss Adele Blanc-Sec is the perfect visual example of Mr Eco's thoughts on how literature informs itself and makes itself culturally apt for the audience of each age. Umberto Eco is no true intellectual literary snob. He may deplore the use of dictionally inappropriate language, metaphor, allegory, but he welcomes the evolution of expression, the directness of unloaded language. "In a world where the man in the street cannot speak, even the poet must remain silent."p.157. Signposts (note Eco cautions against the use of the word 'symbol') abound throughout the film, in a funny, fantastic, bizarre way. It demonstrates the intertextual irony of which Eco writes - if you don't know what happened to the Titanic, you won't understand the fate of our heroine, Ms Blanc-Sec (or Dry-White (as in wine), if you prefer English - see what I mean?). If you haven't read Michael Crichton's Jurassic Park, the use of a pterodactyl will seem as good a choice as any for a creature hatched from a prehistoric egg and which apparently informs the design of our modern feathered friends. Harry Potter and the Prisoner of Azkahban receives due homage in a daring flight of rescue, and Ms Blanc-Sec herself seems an intrepid heroine without our knowing that she is pre-dated by Indiana Jones and Lara Croft. The noir of the film is all French, all Besson. Eco notes how our interaction with a text is never devoid of our own circumstances - any reading of a book on its own merits, without acknowledging how our personal experiences inform how we respond to a book is, at best, naive. Having lived in Paris (I recommed a sub-titled version if you don't speak French, rather than dubbed) and being familiar with Besson's cinematic style only made my experience of this film richer. But Besson doesn't exclude; just as Eco postulates, writing weaves meaning at more than one level of sophistication, so even if you haven't lived in or visited Paris for any length of time, this film will still appeal. Like Eco the fiction writer, Besson is a director who dares cross established genre borders and upsets both sides of the establishment (commercial vs indie) as well as the Atlantic (US vs Eureopean). But he never loses sight of his primary goal. Regardless of his delight in pushing the envelope, Besson focusses on entertaining his audience. And that is the point of the tantalisingly brief last essay of Eco's collection: avoid the narcissism of writing for oneself. "There is only one thing that you write for yourself, and that is a shopping list....Every other thing that you write, you write to say to something to someone....One writes only for a reader. Whoever says (s)he writes only for (her)himself is not necessarily lying. It is just...frighteningly atheistic. Even from a rigourously secular point of view....desperate (is) the writer who cannot address a future reader."p.334. Eco, in his essay on the anxiety of influence (pp.118-135), acknowledges himself to be the inept musician replaying his version of the melodies belonging to those to whom he owes the debt of influence. That sense of awe he holds for Borges 'limpidly classical' style, I have for his lyrically contemporary own. There's an essay in this collection titled "On Camporesi: Blood, Body, Life." In it, Eco writes about Piero Camporesi, who in his writing apparently "invites us to look inside ourselves" -- not just emotionally, but viscerally, in terms of blood and body. Eco finds this very strange, unique, and suggests -- perhaps sarcastically, but I doubt it -- that you read it in small doses. It's too real, this guy's writing, you see: you probably can't handle it all at once. And that, in a nutshell, is why There's an essay in this collection titled "On Camporesi: Blood, Body, Life." In it, Eco writes about Piero Camporesi, who in his writing apparently "invites us to look inside ourselves" -- not just emotionally, but viscerally, in terms of blood and body. Eco finds this very strange, unique, and suggests -- perhaps sarcastically, but I doubt it -- that you read it in small doses. It's too real, this guy's writing, you see: you probably can't handle it all at once. And that, in a nutshell, is why reading Eco is such a frickin bore: this guy is all brain, no blood. I've read pretentious, self-absorbed literary essayists before -- Eco takes the cake. Even Harold Bloom has more joy and openness in his writing -- Eco, when he's not writing extensively about his own fiction as if it tops all else (seriously! ), is more semiotics professor than reader. Fine -- but you can't take the blood out of literature and expect readers to connect with you. I can picture having to read essays from On Literature in a university class, but I wouldn't take any seriously: they're too self-indulgent, too ivory-towery, to be useful in today's literary climate. Things have changed -- the old canon-obsessed white guys don't hack it anymore. The writing itself is repetitive, verbose, and excessive -- too many examples listed, not enough meat to any argument. Most of the essays could have been chopped by half, others didn't need to be written at all (the one about falsehood in texts and how it's not bad?? everyone already knew that??). I guess I liked "On Style" best, but there were exactly two things that interested me beyond that. The first was the discussion on formal stopgaps (in "The Flaws in the Form"), which was a cool perspective on how our brains automatically flip past phrases like "he said" when reading, and how the writer can use this to their advantage (or, at least, accept it as inevitable -- not every sentence can or should be beautiful). The second was the process of creating novels through 'seminal ideas' (in "How I Write"), but I got more out of Steve Erickson talking about that concept for 3 seconds in a YouTube interview so..
Cominciando con un’opinione generale su Alcune funzioni della letteratura per finire con un resoconto personale e dettagliato di Come scrivo, Sulla letteratura è una raccolta di “saggi Bompiani” che ci invita a una passeggiata nei boschi della cultura universale, senza un ordine apparente. Dico apparente, perché c’è un “sopra tema” che unisce i capitoli: la ricezione dell’opera che rivela maschere e atteggiamenti dei lettori, divisi dall’autore in due categorie: di primo livello, diciamo semantico, di chi vuole sapere come la storia vada finire e di secondo livello, diciamo semiotico o estetico, di chi vuole sapere come accada ciò che è stato raccontato. Ovviamente, Umberto Eco si rivolge alla seconda categoria quando identifica, per esempio, la principale funzione educativa della letteratura, che non sarebbe quella morale (certo che no! ), nemmeno quella estetica (ah, no? ), ma quella… ontologica : cioè l’opera ci educa "al Fato e alla morte", all'idea d'irreversibilità del destino, come irreversibile e immodificabile è il destino di un Edipo, di una Bovary, malgrado tutto ipertesto che cercherebbe di cambiarli. Tutti gli articoli, benché di valore ineguale, hanno un incanto speciale, grazie probabilmente al ritmo narrativo sostenuto, proprio di un Eco sempre fedele alla sua decisione di fare di ogni saggio critico una narrazione (le difficoltà che io devo riconoscere di aver provato a volte sono state di origine lessicale piuttosto che semantica!). Geniale mi è sembrata l’immagine di Joyce e Borges come se prendessero la cultura universale per un terreno di gioco dove Joyce dribbla con le parole, mentre Borges con le idee (Tra La Mancha e Babele). Stessa opinione superlativa a proposito del saggio sull’ironia intertestuale, che non sarebbe proprio un’ironia, ma piuttosto un’allusione culturale (Ironia intertestuale e livelli di lettura). A parte le informazioni intriganti (e non sempre conosciute) sulle grandi frodi della Storia, ho avuto il piacere di scoprire un primo schizzo del romanzo Il cimitero di Praga nel saggio La forza del falso. D’altra parte, se posso capire la sua ammirazione per lo stile del Manifesto di Karl Marx, devo ammettere di non condividerla ☺. Conosco talmente bene (per averla vissuta) quell’alternanza (che Eco ammira tanto) tra gli slogan e le spiegazioni che ne sono davvero stufa! Ecco un buon esempio di ragionamento preconcetto. Per finire, prevedo che, dopo aver letto lo studio su Wilde non riuscirei più a leggere un aforisma senza verificare se è “cancrizzabile” oppure no. Comunque, non concordo con l’opinione che l’opera di Wilde sia fatta di questo tipo di aforismi. Come ho detto un’altra volta, se si tiene conto della sua estetica che proclama la superiorità dell’arte sulla vita, i suoi aforismi non possono più essere rovesciati senza perdere il loro senso essenziale. Еко, редом с Борхес и Калвино, са автори, които напоследък ме карат да се чувствам глупав и културно изостанал. Не само, че ме смазват със своята богата култура, те също така убиват всяка надежда някога да се доближа до тях. Дали ще цитира произведения, с които дори не разполагаме на български език или ще се рови в средновековни ръкописи, страстта на Умберто Еко към литературата е уловена чудесно в настоящия сборник. "За литературата" събира в себе си лекции и есета, предимно от 90'-те години, като обръща внимание на основните влияния върху Еко, както и неговите разбирания за това, какво е литература и как трябва да бъде възприемана. Първото есе е лекция, четена на Фестивала на писателите в Мантуа през септември 2000 г. и се отнася до функциите на литературата. Изключително приятно и далеч по-разбираемо от някои от другите, това есе се занимава основно с четенето и начина по който възприемаме литературните персонажи. Спомням си, че Кундера се спираше върху тази тема в "Завесата". Става въпрос за едно негласно споразумение между писател и читател, че измислицата, която човек чете всъщност е един вид действителност. Еко продължава още нататък и пояснява, че макар в действителния живот да имаме възможност за различни интерпретации на някои факти, в литературата всичко установено си остава закон. Затова и ако някой каже, че Ана Каренина заживява щастливо до края на дните си, четящите ще го изгледат особено, но във всеки един момент може да изплува исторически документ, който да промени разбирането ни по даден въпрос (примерно, че Наполеон не е е умрял на о-в Света Елена на 5-и май 1821 г., а на бонапартистки кораб, докато се е опитвал да избяга). Животът е нещо твърде важно, за да говорим сериозно за него. Животът е нещо твърде маловажно, за да можем да се шегуваме с него. Парадоксите, от друга страна, не могат да бъдат преобръщани. Те носят обидни за обществото истини, за разлика от афоризмите, които носят приемливи. Тези, които могат да се преобръщат, според Еко са чиста игра на безразличния към истината дух. "От друга страна, уайлдовските идеи за изкуството оправдават поведението му, като се има предвид, че никой афоризъм не би трябвало да служи нито на ползата, нито на истината или морала, а само на красотата и елегантността на стила." Изключително интересни са двете есета, посветени на Джойс и Борхес. Еко прави сравнения между тях, като пояснява, че единият експериментира с думите, докато другият с идеите. Затова и текстовете на Джойс са толкова шантави, съставени от нови, току-що изфабрикувани думи, които се леят в нестандартни структури, опитвайки се да избягат от каквато и да е форма, докато тези на Борхес са написани конвенционално и просто, в повечето случаи само в няколко страници, но в тях са вплетени идеи, които могат да изискват години размисъл. Припомнете си само "Вавилонската библиотека". Малко са книгите у нас, които хвърлят светлина върху изкуството на писането и функциите на литературата, върху начините по които четем и възприемаме един текст. На фона на реалити програми, набедени поети и пробутвани от медиите бестселъри, четящото общество у нас повече от всякога ми се струва дезориентирано. Затова и малко усилие за разширяване на хоризонта по литературознание никак няма да е излишно. "За литературата", редом със "Завесата", "Това изкуство на поезията", "Изповедите на младия романист" и "Това не е краят на книгите" са едно добро начало. Eco tiene sus cosas. A veces es arrogante, a veces peca de localista (su listado interminable de referencias a la literatura italiana clásica es de difícil acceso para los que no somos de allí). Y este libro requiere de por lo menos unas nociones básicas de teoría y crítica literaria. Si nunca has oído hablar de Jakobson, Barthes o Lotman, posiblemente tengas problemas con estos ensayos. Algunos son bastante técnicos y requieren de ciertos conocimientos previos. Pero el esfuerzo siempre merece la Eco tiene sus cosas. A veces es arrogante, a veces peca de localista (su listado interminable de referencias a la literatura italiana clásica es de difícil acceso para los que no somos de allí). Y este libro requiere de por lo menos unas nociones básicas de teoría y crítica literaria. Si nunca has oído hablar de Jakobson, Barthes o Lotman, posiblemente tengas problemas con estos ensayos. Algunos son bastante técnicos y requieren de ciertos conocimientos previos. These speeches on Literature that make up this book were perhaps the most difficult thing I've ever read. Many things I didn't understand, but many others left me in awe. 4 stars therefore, plus 1 for the Greek translator. I can't even begin to comprehend what knowledge is needed to perform this task! Umberto Eco has been an author whose works I have been trying to finish albeit unsuccessfully for quite some time now. I have tried twice to finish 'Name of the rose' but gave up half way in the process for want of a better reason. Foucault's Pendulum was no better either. The books seemed to mock me ' you need to read much better than this to get to us, boyo !!' was what they seemed to tell me. Every time at the library I pause at the rack on Eco's books and think "Should I ? or Should I not ? Umberto Eco has been an author whose works I have been trying to finish albeit unsuccessfully for quite some time now. I have tried twice to finish 'Name of the rose' but gave up half way in the process for want of a better reason. Foucault's Pendulum was no better either. The books seemed to mock me ' you need to read much better than this to get to us, boyo !!' was what they seemed to tell me. Every time at the library I pause at the rack on Eco's books and think "Should I ? or Should I not ? " but this time I picked up this set of essays and it paid off in a way of its own. Reading this book was like getting to a Labyrinthine library of some volumes which I had not even heard of before. Once in the library Eco sets a brisk pace and walking along you see spines of books that bring vague but interesting recollections to the mind. Eco talks at length of James Joyce, the aphorisms of Oscar Wilde, the influence of Borges in his works and so forth. Language and literature becomes a test sample to him which he slices and dices with relish. The parts on symbolism i skipped for i was never much a taker for it. But the most interesting part to me was the final essay on Eco himself and his writing style as a whole, pretty interesting considering the otherwise serious topics he chooses for the rest of the book. Καταπιάνεται (σχεδόν) με τα πάντα και σε κάνει να ψαχτείς ακόμα περισσότερο! Νομίζω ότι απλά είναι ένας από τους λίγους Δασκάλους..και εμείς τυχεροί μαθητές του! Eseji o književnosti, knjigama i čitanju. Na žalost, dosta se razlikuju po interesantnosti za prosečnog čitaoca kakav sam. Dobiješ osećaj da su neki pisani za elitistički krug i govore o temama za koje ne samo da moraš biti načitan, već i imati toliko vremena da pojedine knjige čitaš i čitaš nekoliko puta, kako bi postao "uzoran čitalac, koji ih razume na svim nivoima". Ako ništa drugo, postalo mi je jasno koliko površno čitamo ponekad, čak i kad nam se čini da smo potpuno udubljeni i fokusirani. Eseji o književnosti, knjigama i čitanju. Na žalost, dosta se razlikuju po interesantnosti za prosečnog čitaoca kakav sam. Dobiješ osećaj da su neki pisani za elitistički krug i govore o temama za koje ne samo da moraš biti načitan, već i imati toliko vremena da pojedine knjige čitaš i čitaš nekoliko puta, kako bi postao "uzoran čitalac, koji ih razume na svim nivoima". Eco desborda sabiduría en torno a la literatura, el lenguaje y la potencia de las letras. The book is a collection of essays written by Umberto Eco for various conferences. Literature keeps language alive. It creates a shared body of stories and characters. Different authors each given them their own spin, but their core is part of the collective consciousness. Paradiso is about light, which was an important concept to medieval readers and thinkers. Cathedrals are all about different kinds of light. We don't pay The book is a collection of essays written by Umberto Eco for various conferences. Paradiso is about light, which was an important concept to medieval readers and thinkers. Cathedrals are all about different kinds of light. We don't pay as much attention to the quality light anymore; and it lessens our ability to truly appreciate the text as much as it was when it was written. The format and structure of the Manifesto is a great sample of packing a lot of power in a concise space. It has all the drama and plot twists of the best narratives. How the imperfect tense can lead to enough fuzziness about the action to leave the reader in perpetual mists and create an atmosphere more felt than any feelings explicitly expressed in words. This effect can then be reinforced and amplified by various narrative techniques. An aphorism is a maxim that is witty and which appears to be true. It expresses something commonplace. A paradox is a maxim that is witty and appears false at first glance, but reveals a deeper truth upon further examination. To tell them apart, reversing an aphorism produces something that still makes sense, whereas reversing a paradox yields nonsense. How James Joyce's style and literary pursuits were already well established by the time he graduated from college. How Joyce and Borges try to re-invent language, each in their own way. Joyce by looking at all permutations of symbols. Borges by looking at all permutations of ideas. Another interesting piece is how in Don Quixote, the story starts when the main character leaves a library to discover the world outside. In one of Borges' novels, the main character enters a Library of Babel to escape from the world outside and experience reality through books. Sometimes, an author borrows an idea from another author. Sometimes, an author develops an idea from the general context, not knowing that another author has also expressed the same idea too. Some times, an author develops an idea from the general context, not knowing that another author was directly responsible for putting it there. Camporesi was a cultural anthropologist who studied texts for cultural artifacts, studying the underbelly of civilization. Symbolism as understood by the scholastic philosophers. There is the perceived world of phenomena and the world of ideals hiding behind it. In this way, everything is a symbol that stands for an ideal which we cannot perceive directly. Style is how a work of art is put together. Eco identifies three ways of studying style. In a review, the writer tells the reader about a book the reader has not yet read and impose the writer's judgment. A history of literature discusses works that the reader already knows. In both cases, the writer can do artifex additus artifici (an artist writing about an artist) where he explains how he felt as he produced the work of art. Or he can do philosophus additus artifici (a philosopher writing about an artist) where he explains why a given work of art is beautiful. The third way of studying style is the semiotic reading in which the writer shows how the work of art produces pleasure, rather then prescribing what gives pleasure. How a writer relies on some common images or experiences shared with the reader. If the reader does not share a given image or experience, part of what the writer was trying to communicate will get deformed or lost. Elements in the structure of a text. If the work of art arises from the whole of the composition and how the parts all fit together, then which parts essential? Does it mean that everything else just fodder? Will the art still arise if we remove those non-essential parts. And what about stopgaps, small particles that enhance the flow of the work and assure its stability? Draws heavily on Eco's Reflections on "The Name of the Rose." Eco is a big fan of layering multiple levels of meaning in his prose. The reader can choose which level they latch on when interpreting a text. Not all readers can access all levels of a text. Some of them require specific knowledge to fully grasp them. But missing out on one level should not keep the reader from appreciating others. The influence of Aristotle's Poetics. Notions of pragma (action) and mythos (plot) and how they apply to the many forms of story-telling. Disregarding American politics, American literature of the late 19th and early 20th Century appealed to European intellectuals. The American it portrayed was open and free and devoid of all the barriers and structures that were so limiting on the Old World. How lies and fakes have played pivotal roles in the history of the Western World. The Donation of Constantin solidified the power of the Catholic Church in Rome and was the basis of the power of the Papacy from the fall of Rome to modern times. The letter of Prester John motivated the West's exploration and expansion into the East. Eco's own quirky approach to writing his novels. It focuses on The Name of the Rose, Foucault's Pendulum, and The Island of the Day Before, with some bits about Baudolino. He describes parts that were essential to him which I do not remember at all. Makes me want to re-read all his novels. Right now. Quote I hated: "the wretches who roam around aimlessly in gangs and kill people by throwing stones from a highway bridge or setting fire to a child—whoever these people are—turn out this way ... because they are excluded from the universe of literature and from those places where, through education and discussion, they might be reached by a glimmer from the world of values that stems from and sends us back again to books." Eco combines several essays - each focused on one book (most of which I still haven't read) and on a particularly striking aspect of this book. Reading "On Literature", you are led into the dark and imposing forest of literature and suddenly realize that it's not as tangled and incomprehensible as you imagined. One of the essays explores the power of space and movement in a narrative. I did not realize that a skilled writer can use the word almost as a movie camera - moving it in space, zooming in or zooming out, changing the angle and the way the situation is presented. It was rather eye-opening for me. Another very memorable essay exposes the sleight of hand that another writer uses to seemlessly move the narrative back and forth through time in a story. A very trivial thing, but picking it apart and seeing how it's done was an amazing learning experience for me. As always, Eco is brilliant, clear and factual on all things he has to say. Some of the articles requires understanding of Italian literature or classical literature which I skipped because my lack of knowledge. But those on symbolism, perception of American culture in Italy, and particularly 'How I write?' and the 'The power of falsehood' were superb. The last two are actually pretty necessary to understand Eco's novels and the ideas from which they germinated. Eco cites Borges as a major influence, and it's clear fun to read his linking of Borges, the possible world of the possible library, incontrovertible facts in fiction, hypertext, Dante, Wilde, and on. A fine mind, if far more 'academic' than Borges. Good criticism here; if you are averse to semiotics, you may not like it so much, but Eco draws creative threads and reminds us that a society without literature is a poor one indeed. Very interesting. Umberto Eco is a very well-read man. I enjoyed reading this because of his multiple references to his own works and other works. Eco especially likes The Divine Comedy and mentions it every chance he gets. He also talks about James Joyce and Jorge Luis Borges a lot, which explains his influences and other things. I would read this again. The book is worth reading, however, it seems that it heavily gravitates towards repetitions of my favorite "Six walks in fictional woods" and very much of "Confessions of a Young Novelist". Mr. Eco discusses the main pillars of his approach to creative writing, on developing ideas, and meticulous technique of developing the story in time and space. To me, it does not seem necessary to set the action, let's say, on 15th of October 1895 in Paris in the 5th district, and then to check the exact tim The book is worth reading, however, it seems that it heavily gravitates towards repetitions of my favorite "Six walks in fictional woods" and very much of "Confessions of a Young Novelist". Mr. Eco discusses the main pillars of his approach to creative writing, on developing ideas, and meticulous technique of developing the story in time and space. To me, it does not seem necessary to set the action, let's say, on 15th of October 1895 in Paris in the 5th district, and then to check the exact time of sundown with the help of archive data on the subject, but writer knows the best. I will have to reread this when I am smarter, but I thoroughly enjoyed what I understood. As most collections of Eco's work, this is an assortment of essays and speeches, but this one particularly has a more studied style. As for the individual pieces, three stood out as addressing the process of writing in a broad context: "On Some Functions of Literature," which addresses the eternal problems of what literature does and how it exists independent of its author; "Borges and My Anxiety of Influen I will have to reread this when I am smarter, but I thoroughly enjoyed what I understood. As most collections of Eco's work, this is an assortment of essays and speeches, but this one particularly has a more studied style. As for the individual pieces, three stood out as addressing the process of writing in a broad context: "On Some Functions of Literature," which addresses the eternal problems of what literature does and how it exists independent of its author; "Borges and My Anxiety of Influence," which addresses the complexity of living and writing in relation to a beloved, respected, and famous author; and "How I Write," which is a detailed description of a writing life that touches on details and generalities and was of particular delight after having read a little of his fiction. The remaining pieces of the book are mostly sorted into two categories: those which dissect certain texts or authors, and those which address technical or critical aspects of literature. A few of note: "The Mists of the Valois," which dissects "Sylvie," by Nerval, a work Eco has elsewhere called "the text of my life," on an atomic level. There are tables, there are comparative charts, there are excellent analyses. After reading "Sylvie" to get more out of the essay, I think I liked reading Eco's thoughts on it more than I enjoyed the work itself. In the second category, "The Power of Falsehood" was an excellent tour through some of the conspiracy theories and misconceptions that shape our modern world, complete with ancient map controversies and some good old hollow earth talk. По-скоро gratia sui, oт любов към себе си, посегнах към „За литературата“ (изд. „БАРД“, 2015) от Умберто Еко. След разочарованието „Нулев брой“ теоритичният размах на италианския автор бе нужната разходка из гората на словото, с която да разсея лошото впечатление, оставено от гореспоменатата. Umberto Eco's ON LITERATURE is another literary treat. These are three hundred pages of sublime thoughts from the superstar academic-novelist. What I loved about this book is how Eco really goes in to the technical aspects of storytelling. There are useful chapters on the 'functions of literature', style, symbolism and irony. My favourite chapter is called 'How I Write' where Umberto Eco writes about how he ended up writing most of his successful novels, especially THE NAME OF THE ROSE. And the Umberto Eco's ON LITERATURE is another literary treat. These are three hundred pages of sublime thoughts from the superstar academic-novelist. What I loved about this book is how Eco really goes in to the technical aspects of storytelling. And the very last page even has an interesting point about the Ideal Reader. 4.79% "One of the functions of literature is to create true fictions. If we change those truths, which we can through hypertextuality, then... well, then what? Then fictional truth becomes untruth and Eco gets the lip on? Well, boo-hoo." 6.89% "Eco likes Dante's Paradiso a lot and seems to imagine that others don't." 8.38% "Eco thinks the Communist Manifesto is a fine piece of rhetoric and should be studied as such. Not sure whether that makes him a communist, though." 18.56% "Eco talks about a boo 4.79% "One of the functions of literature is to create true fictions. If we change those truths, which we can through hypertextuality, then... well, then what? Then fictional truth becomes untruth and Eco gets the lip on? Well, boo-hoo." 18.56% "Eco talks about a book I have not read (Sylvie by Nerval) and tells us many interesting things about the novel: how a plot is constructed, the difference between a plot and a story, the symmetries that can exist in a plot, the uses of past imperfect (to step away from time), the use of symbols, the way that a plot can circle around and the difference between author, implied author (pseudonym) and narrator & character"
25.15% "Eco talks about aphorisms (reversible or otherwise) and paradoxes, particularly those of Oscar Wilde, and comes to the conclusion that Wilde himself didn't believe in any of them (aside from 'all art is quite useless') and just used them as a way to make a character distinct, which is, I think, quite a useful thing." 31.14% "Surprisingly easy book to read in light of the reviews that said that they couldn't get on with it because they either didn't know as much stuff as Eco, or had not read the books he forgets to. I think there are lessons to be gained here over and above this. In this chapter Eco theorises that James Joyce's writing was inspired by The Book of Kells (labyrinthine and somewhat incomprehensible). I want to try." 35.33% "Eco is quite an entertaining and interesting chappy. He has a conversational style of writing (or lecturing) that makes a person (me) happy to be listening. That last chapter was about playing with words to make an ideal language. There's the signifier (the word) and the signified (the object the word describes). You can stretch the former as far as forever, but the latter will not stretch beyond what it is." 40.72% "Eco waffles on about Borges. Never read any of his stuff, but Eco has. This is pretty much Eco's defence against claims of 'influences'. Plagiarism by any other name smells just as funky (however many diagrams you draw that point to culture as being the influencing factor)." 41.92% "Eco talks of the books of Camporesi, which talk of blood. Ideas for stories suggest themselves to me as I listen to Eco. One about ... something was suggested here. But now the idea is gone. Washed away by the tide of blood in the rest of the chapter." 48.2% "Lovely chapter on symbolism in which Eco said much without actually saying much. I like the medieval idea that the world is just a surface layer on top of the real meaning of things/life (or something like that). Also, that when everything has a second sense/meaning this makes life dull. The sense (for me) that we will find our life when it's too late." 53.89% "Exo says what makes the most sense to me: that the most valuable aspect of any critique is to tell the reader (and the writer) how the various effects (principly, the experience of the sublime) are brought into being in terms of how the sounds, words, phrases of a text are organised to do so." 60.18% "Eco talks of hypotyposis, which is the use of words to make the addressee (reader if the words are written) construct a visual representation. There are four methods: denoting, describing, listing, accumulating and appealing (to the reader's previous experience). It's a fun chapter and I can now see the rain." 63.47% "Eco talks without effect (on me) about something or other, but I can't fathom what. The essence? If pushed, I would say it is this: both flowers and field are necessary." 70.66% "Eco tells of many ways in which one text can contain the echoes (no pun intended) of previous texts, and it's fun to go through them, but at the end of the chapter I'm left with the sole idea that a text can be read on many levels, depending on how sophisticated the reader is, but it's not essential to do so. A writer should read other texts in the same subject and be immersed in the experience he is writing about." 76.35% "In which Eco shows off by using lots of incomprehensible words. It's not big and it's not clever, Eco, to casually drop words like glottogonic in a treatise about Aristotle's Poetics. Just saying. And yes, I know I can look it up. And no, I don't want to. If I have to look up a million words just to read a piece of writing, then I'd rather read another one instead; one written by a more accommodating author." 81.44% "Eco and America - interesting bedfellows. In 1980 he talked about her from the point of view of Italians who were young men more than forty years previously and I come away thinking that people are fond of thinking that the grass is lusher on other shores. Not much of this chapter was on literature so I'm not sure why it was included in this volume." 90.42% "Eco muses on and talks about the nature of truth and falsehood and then declares that it's just as likely that we'll discover that the universe does not exist as it is that we have discovered that the earth is not flat and the Rosicrucians are alive and well and living in a bedsit just off Ealing Broadway. Or maybe I made that last part up." Eco reminds me of many things, but this most of all: that which I have read is but a drop in the bucket. There are moments in these essays that make this point more obvious (especially since Eco addresses his readers as though they are familiar, even intimately so, with the works--even the arcane ones--under discussion. Still, his erudition and clear delight vis-a-vis the written word is inspiring. I like reading Eco on his writing and on language in general. He takes an infectuous delight in language, as a reader and as an author. Other than the Name of the Rose I have not managed to finish any of his novels, but am fascinated by the processes he lays out in this book, and in Mouse or Rat, another non-fiction book by him about translation.